Barcelona - It is very far indeed from being the only golden rule of training under the orders of Herr Josep Guardiola - but it's easily the quickest way to fall foul of him: don't be late. Ever. While it's infamous that a player who was capable of starring in the Bundesliga, Alex Hleb, simply could not attune to the seriousness of Guardiola's daily demands, there is also an equally famous picture, taken towards the end of his first season at FC Barcelona, where Guardiola is addressing his former team-mate and current captain, Carles Puyol. One trophy, the Copa Del Rey, is already in the bag and the league title is almost assured. It's success beyond measure and Guardiola's players have responded to him like the finest chorus and orchestra hit their chords and tempo under the baton of a fine conductor. Harmony. But on this day Puyol, and two others, are a mere flutter of minutes late onto the training pitch. 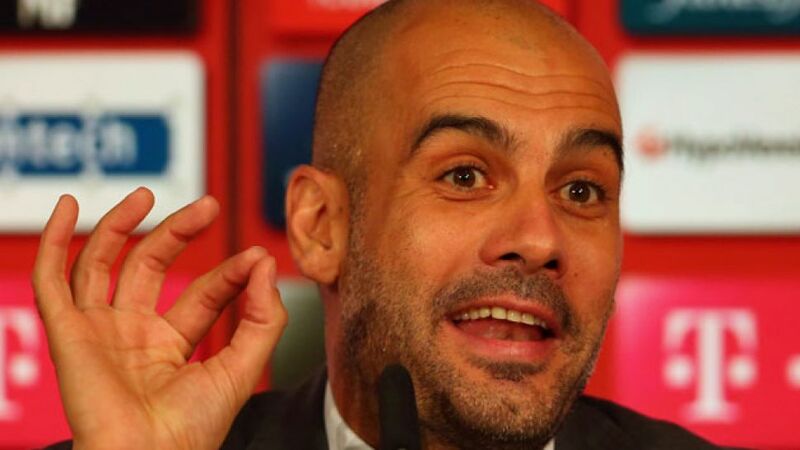 The image is of Guardiola, arm extended, wrist cocked, right hand pointing to the left wrist where his elegant watch is: "What sort of time do you call this" is what he can be seen mouthing. There's no conspiratorial or even tolerant smile on his face. One rule, every day, every man. No exceptions. I know, full well, that there is a universe of difference between taking over your first senior job and inheriting a squad which is unfit, slack and has fallen embarrassingly below the standards of excellence they themselves desire (the case in 2008) and getting your hands on the reins at FC Bayern Munich. Last season's treble was not only sensational, it was a product of talent multiplied by extreme discipline and professionalism. Fine. But Pep is Pep. Be on time, don't be six ounces over your prescribed weight, be in bed pre-midnight on all working days, don't be tying your shoelaces as the training session begins, be prepared, be intense, train with more attitude and energy, even, than that with which you play. Not sometimes. Every time. This is not at all to say that Guardiola is a martinet, nor joyless, nor dry. Often at Barcelona the players enjoyed their training life enormously - a) because they were well designed (the modern player hates and fears boredom at all times) b) because there was a direct and quantifiable connection between daily work and victories at the weekend and c) because Guardiola, a world-class footballer in his moment, understands when to press hard and when to allow tired minds and limbs to have short periods of rest. Time off. Initially, fitness and the new leader getting to know his troops will be predominant. The very first season of Guardiola at Barcelona, in a St. Andrews training camp, the players were ran until they could have played the UEFA Champions League final there and then in late July. And they were walked through the playing style he demanded of them. Play was stopped, regularly, so that he could insist on minor details which, conglomerated, meant a lot, and let flow when everyone clearly had the message. Tactics, like incentivising his Barca players if they could win three straight Champions League matches might bankrupt the Catalan if introduced at Säbener Straße, but there will be something via which a carrot is dangled. Team talks? Well, truly, this will be fascinating. His monologues, not just before matches but generally, were awarded messianic status by the Barca squad which won him 14 trophies in four years. His German will impress, I'm sure, but will he be able to stir, inspire and inspire in a foreign language? That will fascinate. One core value, which the Bayern players will I'm sure appreciate, is that he likes not to have them in hotels, planes, buses or airports any more than is necessary. At Camp Nou he told them a light but important training session on the day of the game will be de rigeur but you will then be free, sometimes for eight hours, until the night time kick-off to be with friends or family for home games. See you at the stadium 90 minutes before kick off. Away games? Wherever possible these were travelled to on the day of the match, thus saving many dozens of overnights in hotels, away from kids, families and normal routine. Freshness, vitality, intensity - these are the little holy grails of a Guardiola regime. But it will be demanding. He pays attention to who likes extra night life, whose girlfriend lives in France, Italy or Hamburg and requires flights to visit on days off. Normally the analysis which Guardiola and his scouts, who are experts in video editing, produce for upcoming matches are of the highest quality. Higher than that experienced under Louis van Gaal and Jupp Heynckes? Who knows. In fact who needs direct comparison? The work will be first class. Guardiola sits, alone, for hours studying these DVDs, waiting for his 'Eureka' moment when, literally, a shiver of joy passes down his spine, there's a revelation in the analytical part of his mind and a torrent of clear, inspirational instructions pours down on his squad. Anyone who is up for this, any Bayern player who wants more of the sweet nectar tasted last season is going to enjoy daily work under Pep Guardiola. Anyone else ... well, time to say Auf Wiedersehen. Graham Hunter is journalist specialising in Spanish football and author of Barca: The making of the greatest team in the world. You can follow him on Twitter at @BumperGraham.